I'm going to talk a little about the Crest 3D White Whitestrips Professional Effects and my experience with them. 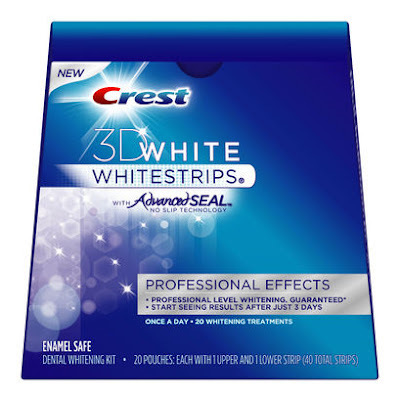 Crest 3D White Professional Effects Whitestrips provide professional level whitening results that last up to 12 months. Featuring Advanced Seal technology, these no-slip Whitestrips allow you to talk, drink water and go about your day while you whiten with no sticky mess. Use for 30 minutes, once a day for a stand out smile. Plus, you'll start seeing results after just 3 days. Advanced Seal technology allows you to talk, drink water, and go about your day while you whiten and the Whitestrips won't slip. Enamel safe. Same whitening ingredient dentists use. Give yourself a smile makeover with professional level whitening results at home. Easy application. Safe and easy to use. My Thoughts: I'll definitely pick these up again if I need to whiten my teeth again later on down the road (I love my coffee), after just the first couple uses I could tell my teeth were getting whiter. For the treatment these give it's definitely way more affordable then shelling out $400+ to a dentist.